Over the past several weeks we have revealed a great deal about Big City Stories. Switching between planning your city and playing in it comes at the press of a button. The objects system lets you create race tracks or obstacle courses. Activities have you defending the city from zombies, and our social features offer public spaces to find friends to invite into your city. Yet, up until this point we haven’t outlined the inner workings of the economy. 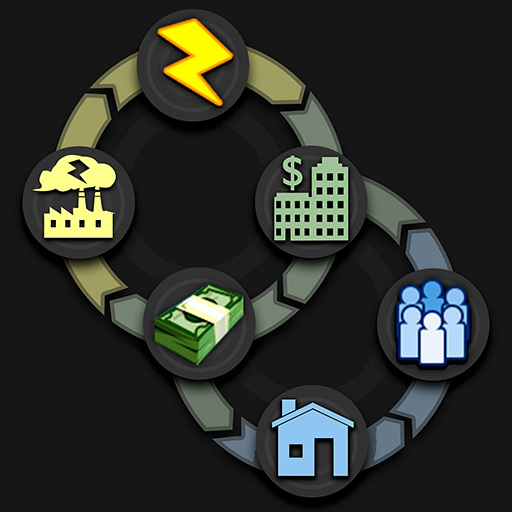 Although Big City Stories has several classes of buildings, the three main types that directly impact your city’s economy are power, commercial, and residential. As mayor, you must determine when, where, and which buildings to construct in order to maximize your city’s economy. Power buildings produce Energy. These include windmills, power plants, and nuclear power facilities. This Energy is collected and stored in batteries or grids until you are ready to use it. The stored Energy is necessary to construct commercial buildings. Commercial buildings are the businesses that employ your citizens and generate Dollars. Banks will hold the Dollars you’ve collected until you’re ready to spend them on things like objects, service buildings, or residential buildings. Most importantly, you need Dollars to build Energy producing buildings. In order to grow your commercial sector, you’ll need the Energy to do so, but you must maintain steady Energy production to support your commercial buildings. Residential buildings factor directly into your commercial buildings’ ability to produce Dollars. When you construct houses or apartments, the citizens who move in will work in your businesses. If you don’t have enough residential buildings, then your commercial buildings will be short of employees and their productivity will fall. Commercial buildings that are short on employees produce fewer Dollars which impedes your city’s growth. Adding another layer of consideration are the effects that buildings have on each other. Many buildings have attributes that impact neighboring buildings within their “Areas of Effect” (AoE). There are three such attributes: happiness, environmental quality, and security. Buildings with positive attributes will increase Dollar production in the structures around it, or even attract more citizens to your residential buildings. Negative AoEs will have the opposite effect. As mayor, you will need to carefully consider how you construct your city in order to maximize growth. You’ll balance Power and Commercial buildings in order to create a steady stream of Dollars and Energy, build homes to supply employees, and consider ‘areas of effect’ when placing your structures.